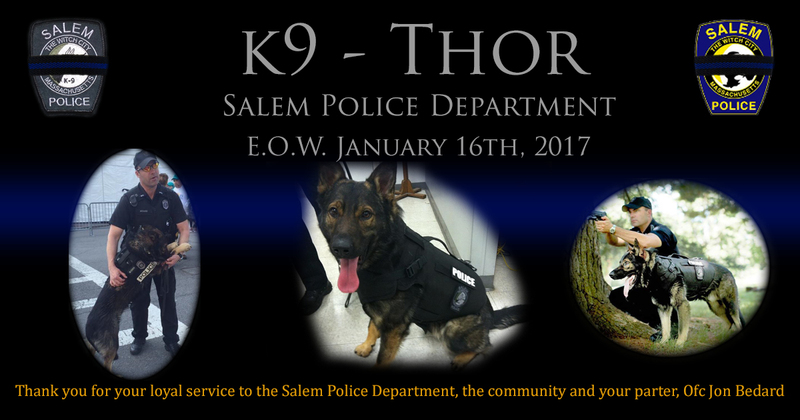 It is with a heavy heart that we announce the unexpected passing of Salem Police Canine Thor. Thor has been a member of the Salem Police since 2012 and was trained in patrol and explosives ordinance detection. Thor and his partner Officer Jon Bedard loyally served the citizens of Salem responding to calls, locating missing and wanted persons, and investigating suspicious packages. In addition to his work with Salem, Officer Bedard and Thor responded to mutual aid requests across the Commonwealth. Officer Bedard and Thor worked countless events including responding to the Boston Marathon Bombings in 2013. The entire Salem Police Department mourns the loss of Thor, and our thoughts and prayers go out to Officer Jon Bedard and his family.